Most mountain folks make “hootch” and never realize it. Sourdough bread is another mountain tradition. Nothing is more endemic than a loaf of native sourdough bread. Nobody really knows when people began the making of a sourdough starter, or levain a more proper term, but historians have found evidence around 1500 BC that the Egyptians used a sourdough starter to prepare their bread products. Anyhow, sourdough arrived in the Boston Mountains with the earliest settlers. Homemade, crusty, and yeasty sourdough bread. Making your own sourdough starter is “simple as pie.” A starter is basically a 1/2 cup of warm water and a 1/2 cup of flour. Flour naturally has yeast and beneficial bacteria. You don’t have to add any yeast to your mixture. [You can add yeast, but we purists believe that is not the “honorable” way to do it.] Loosely cover your “chef” or “mother dough” and leave it at room temperature. After 24 hours, throw away half and “feed” it with another 1/2 cup of warm water and a 1/2 cup of flour. Normally, after about three days you will have a bubbly and frothy mixture. It should smell like beer. Once it reaches this stage, you have successfully created your first starter. Refrigerate your starter in a glass or ceramic container with a loose lid. 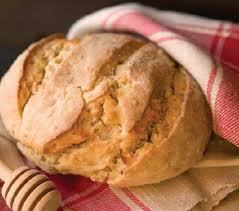 Anytime you want to bake some bread, simply use half of the mixture with your regular recipe. Then feed your starter again. The only thing that can destroy your starter is temperatures of 100 degrees or more. Freezing will not kill it. Some mountain folks have kept a starter for over twenty years. Your starter will taste different from anybody else’s. In other words, no one will ever be able to imitate your recipes. Now comes the “hootch.” The liquid that occasionally settles on top of your starter is called “hootch.” Simply stir this back into your starter or pour it off from time to time. In the mountains, if you have sourdough starter, then you are cheerfully guilty of making and keeping “hootch” on your property. This entry was posted in Recipe and tagged Boston Mountains, Bread, Cooking, Egyptians, Flour, Pre-ferment, Sourdough, Yeast. Bookmark the permalink.